On the Arduino dock 2, GPIO 19 of Omega2 is connected to the MCU_RESET circuit for software resetting the ATmega. Therefore, the 19 on the Expansion Header is grounded and should not be used for anything but ground. In addition, GPIO 19 on the Omega2 should be kept LOW or it will keep on resetting the MCU. The SD card issue has been fixed. Onion has no intention of selling vaporware, not now, not ever. We have a track record of keeping all of our promises, we're a young company and still learning how to keep to our timelines. We appreciate everyone's patience and support as we're really trying to bring a useful product to the end users. You might have missed modifying the Arduino IDE boards.txt file, without this modification, the Arduino Dock will not show up as a port. Also please make sure you're running avrdude v6.1-1, try running opkg list-installed | grep avrude to find the version info. 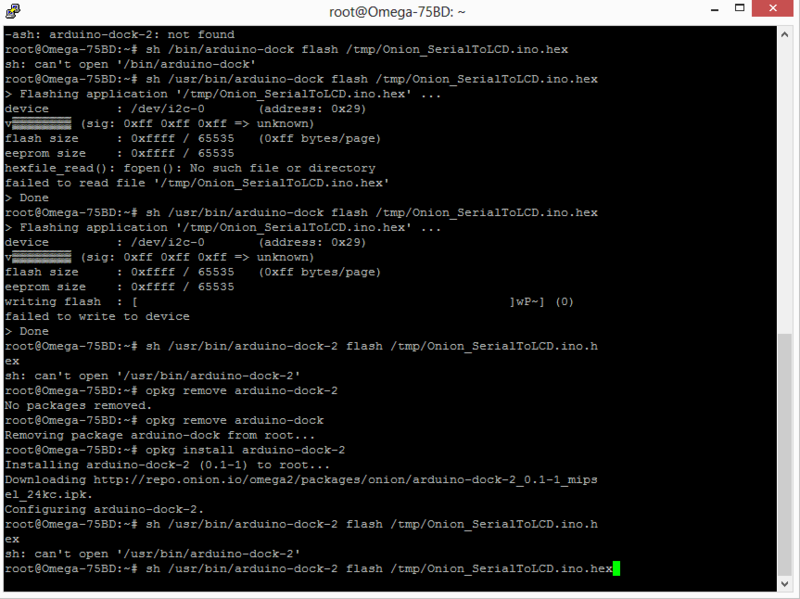 Not sure which bootloader you're trying to find on the Omega's filesystem? I have an Omega2plus 0.1.7 b139 and an Arduino dock v2 0.1-1. 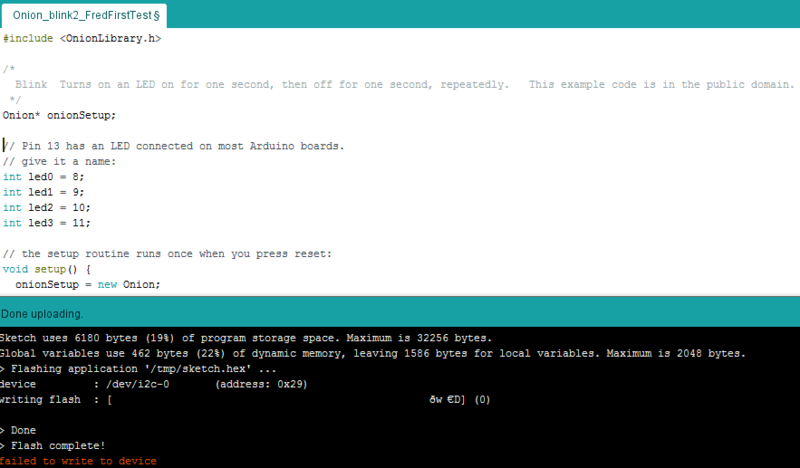 I have installed avrdude 6.1-1 and modified the boards.txt. Even running opkg list-installed and find it still there. What ever I do today as it was working well yesterday between Onion Omega and Arduino IDE but not today, what going on? Found it sometime worked most of the time don't work, think it the antenna kinda hit and miss depend how you place it. If it don't work move it somewhere not too far from the spot. Anyway you try. 0.1.9 b149 seems to have broken my ability to connect to my arduino wirelessly. After updating it looks like the packages were uninstalled. I reinstalled them (opkg update, opkg install arduino-dock-2), still can't see the device. Rebooted my arduino, nothing, rebooted my Mac laptop, still nothing. The boards.txt file is still modified. Any suggestions? edit: pulling the power cord and rebooting the unit that way fixed it! Still, I'm curious why the packages were uninstalled after updating the firmware, I thought those were installed to root? That's due to how LEDE works: whenever you install new firmware, all packages you have previously installed get wiped out. Ok. But why does it say this on the Firmware Upgrade portion of the console? If the packages were installed in root, they should have been fine, no? Firmware upgrade will erase all files outside of the /root and /etc directories. Please backup any custom files before proceeding." @cusackph You're just confusing the concept of the directory /root and the root of the filesystem -- packages are installed into the root of the filesystem, ie. /. It's not very obvious, I know. @cusackph Aye, these are the kinds of things you only learn over time. What's worse is that us, who already know this stuff, are so used to it that it doesn't always occur to us to mention such things anywhere! Yes, software installation wasn't an issue, my problem was fixed after pulling the power cord and plugging back in. After doing a sysupgrade it seems the arduino and omega got out of sync or something, totally pulling the power fixed the issue. @Michael-Xie48 Yes I have, that's when I got that error. with the old firmware i was able to upload sketches on the arduino. then the Arduino IDE sees the board under the list of boards. doing opkg remove arduino-dock and then opkg install arduino-dock-2 makes the flashing work again. now after i did a factory reset i can't manage to upload any sketch. neither via Arduino last IDE nor manually. how can avr-dude be "broken" ? but then this damn problem occurs. i suspect it's the communication between the Omega and the ATmega that is going crazy. What should i do ? should i downgrade to the firmware that had CLOUD registering broken ? cause with that plugin i COULD ACTUALLY upload sketches. i beg anyone to help, i'm starting to be fed-up with this.